We've been working with Portland-based Axian, Inc. over the last few months. Axian provides expert software consulting, contracting and training to clients ranging from small businesses to major corporations. Sanda has redesigned their Web site, www.axian.com, and our Sales Acceleration Team has helped generate sales leads. We're also helping promote Axian services and courses in the media. Sanda has been selected to create a new marketing plan for the Business Enterprise Center (BEC). The site of Sanda's Corvallis office, the BEC (www.thebec.com) was created in 1988 through a grant from the Oregon State Lottery. It serves as an incubator for high-tech and other start-up companies, and has a long and successful record of helping launch new companies. The board of directors is made up of local business people, dedicated professionals from large and small companies alike. The BEC is in the process of selecting a new location and is re-inventing its business model. Sanda will take the lead in promoting the BEC throughout the state. Sanda recently completed a project with VTI Security Integrators, a security system integrator with offices in Minnesota and Colorado. 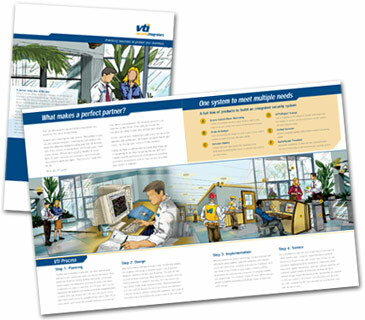 The project, a brochure describing the process of working with a security system integrator and the benefits of choosing VTI, will be used at an upcoming trade show and is the first piece in a series of new collateral material. Take a closer look by downloading a PDF of the brochure (504K). 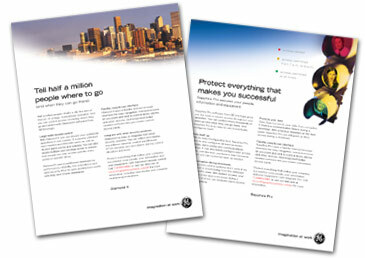 Sanda recently completed a set of ads for GE Interlogix InfoGraphics, based in Garden Grove, California. InfoGraphics makes a line of access control software used in small- to large-sized companies nationwide. The ads feature two of their access control software packages, Diamond II and Sapphire Pro. The ads will run in a series of security trade publications during the next year. View the Sapphire Pro and Diamond II ads by downloading this two-page PDF (610K). Our next newsletter will feature exciting new projects completed for GE Interlogix Video Surveillance Group, TDS and CSG.